cloud atlas is a pousse cafe « AFTER THE POP ! made of liquid, however because of the density and color of each of the liquids, each ingredient remains distinct from its counterparts, resting gently yet firmly apart from its neighbor. 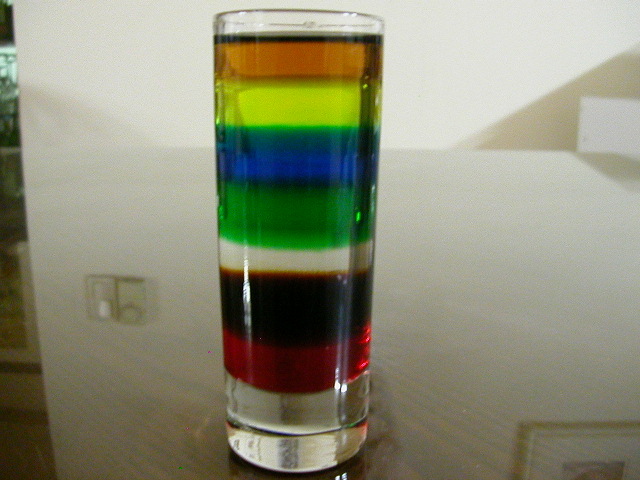 each of these layers of colored liquid form a more perfect union- a collection of tastes that seem overwhelming and overpowering perhaps simply because of the presentation. even though i have no plan to drink, the concept of this zany and monumental digestive concoction came to mind. this is how i interpreted the film “cloud atlas” which i just finished viewing at the theater. it is certainly epic, just as a pousse cafe. it has bold strokes of storytelling layered upon itself, so stimulating to the senses that it is hard to discern the taste. i don’t know if i liked the taste, but the experience was delightful and seemed profound. i haven’t read the book, so i cannot dissect the story transfer. but i can articulate that that it does present the idea of reincarnation, life, death, heaven in a way that felt genuine. i don’t feel able to retell any particular scenes at this point, because i feel as if i heard a fable and need some time to absorb the intent. i do realize that i was not able to pick out all the actors in each of their roles. there are 6 story lines running simultaneously with most of the actors having a role in each one. they look very different each time, sometimes changing races and sexes. i understand that the work was a source of inspiration and true joy for each of the thespians. i know i will see this film again- probably more than once. i also know that the immediate themes that jump out to me such as greed, power, and fate remain a source of intense curiosity and compel and propel each of our generations forward. cloud atlas underscores these ideas. no matter which century there seem to be those who profit and those who foot the bill. the film is an adventure, a fantasy, a fable, and a little philosophical. i savored it on several levels. it is visually astounding, intellectually challenging, and opened my imagination. there is a scene near the end which does involve watching the clouds. it reminded me of the wonder of being a child, laying on the ground, and watching the clouds drift by, change shape and density which engaged my brain and stretched my understanding of life. i know that film changes my thinking. it is an experience for me which i have always and will always value. cloud atlas has done me a great service with a wide stroke of its brush. it is not a small story. i am compelled to explore my assumptions. it is not just a moment in time. it is a multi-layered and colorful legend that i hope will help me get somewhere. so the album posted below does not connect anywhere with this film except in my mind. i have recently been introduced to dj nico (nicolas jaar) and am captivated by his sense of storytelling, tempo, and suggestion. 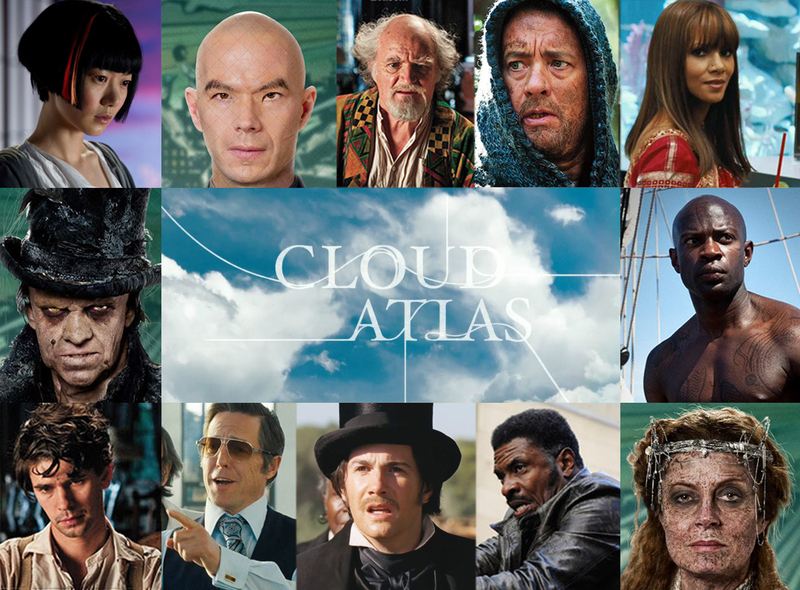 it stirs echoes and memories in my heart and mind, perhaps just as this wachowsky/tykwer film “cloud atlas” did for me. this soundtrack, the film, and a pousse cafe are not not a mere digestif for after dinner. they are an experience for the senses to rejuvenate and inspire. This entry was posted in cloud atlas, film, movies, nicolas jaar, pousse cafe, reincarnation, space is only noise.